The next design in the Hooking Up! ebook is a baby or lap blanket. Again this design is exclusive to the ebook. 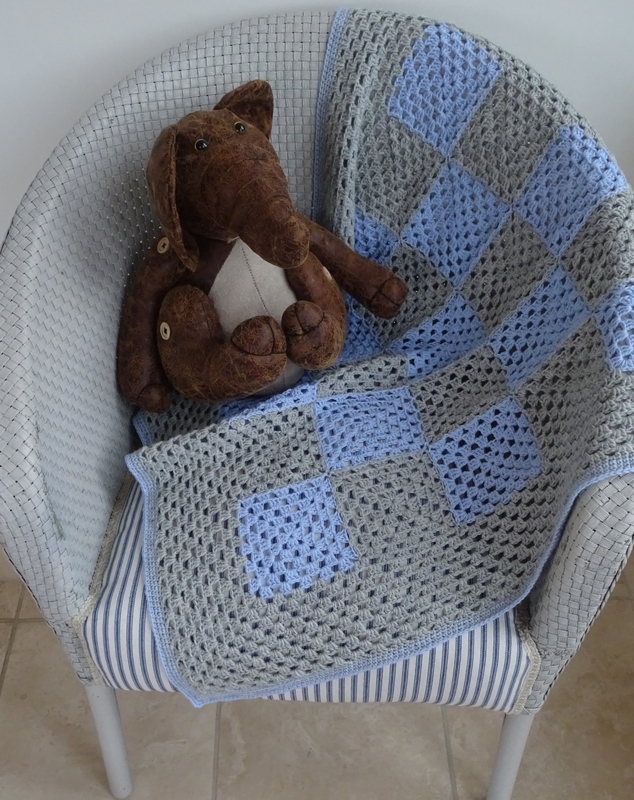 I love this blanket, it was a joy to make and it is a perfect size for the chair, and is an ideal size for a baby! It is included because it teaches some important techniques. The first is how to join motifs as you go (rather than crochet them together or sew them together later); this is a technique which is used in many motif projects. To help you there are a few photos showing the technique. The second technique is how to do a ‘granny’ border that lies flat. Too often I see granny blankets with a ‘granny’ edging that looks wavy rather than flat and it is very easy to avoid this if you know how. Finally it has a nice final edging which is firm and very practical. If you haven’t made a granny blanket before then this is a good one to try, provided you want to learn a few new techniques.